The objective of the work is the assessment of the phenomenon of convergence of agriculture in the provinces/ voivodeship (NUTS 2) in Poland in the years 2003–2014 in relation to the use of European funds designated for development of agriculture and rural areas. The study specified dimensions of support under the European Funds granted for agriculture and rural areas in individual regions, which were compared to the size of gross added value of agriculture, forestry, hunting and fishery. Within the analysis, data of the Agency for the Restructuring and Modernisation of Agriculture as well as The Local Data Bank of Central Statistical Office were used. 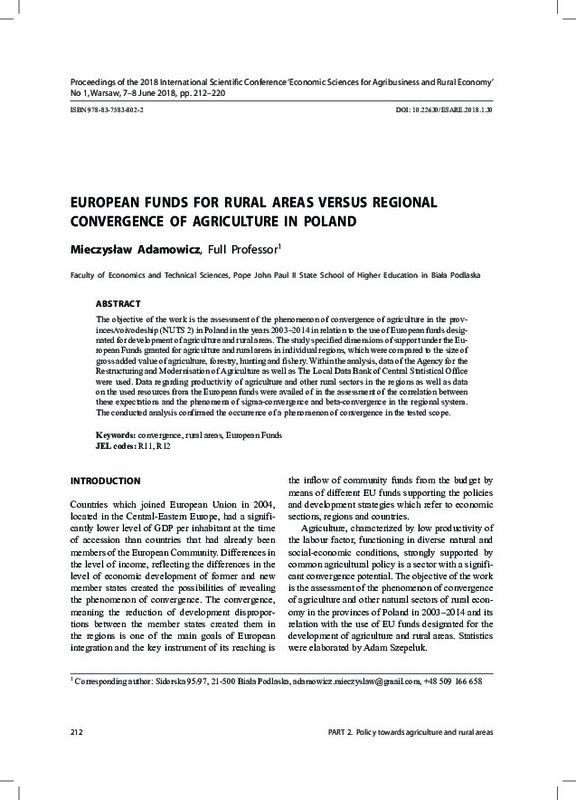 Data regarding productivity of agriculture and other rural sectors in the regions as well as data on the used resources from the European funds were availed of in the assessment of the correlation between these expectations and the phenomena of sigma-convergence and beta-convergence in the regional system. The conducted analysis confirmed the occurrence of a phenomenon of convergence in the tested scope.